Eighty-one years ago TODAY, Joseph Ratzinger was born in a Bavarian town. Bavaria is the most Catholic region of Germany, a place where the local culture is steeped in all things Catholic. Joseph absorbed these influences unconsciously and came to treasure them. He also acquired other Bavarian traits-reverence for tradition; a love for beauty; and a devotion for one's homeland. These traits paved the way for a boy coming of age in Nazi Germany to become a great priest and for a great priest to become an extraordinary Pope. Since he is here in the United States, my roommates and I invited the Pope over for a little celebration in honor of his birthday. My camera was acting a little crazy so I only got a few pictures. We played many games. You might not realize but the pope actually like games, but being the Pope come with specific papal birthday games. The Holy Father was kind to teach them to us. First there was the Papal Pose off. Each person strikes their best Papal Pose and the judges vote for the winner. 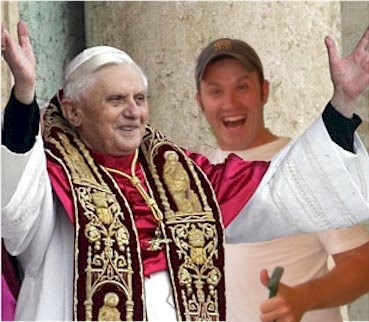 You see my roommate give the Pope thumbs up approval. Really people, how can you compete with the Pope in a Papal Pose Off? Though it might look like we are eating breakfast, do not be deceived. We are really playing the St. Augustine Showdown Throwdown, which it turns out has been a papal favorite with Pius X, John VI, and Paul I. The object is to read Augustine's Confessions in the original Latin as quickly as possible, out loud, and with as best pronunciation as you can muster. It took the holy Father 7:77 to read the entire text with a pronunciation score of 9.5. Needless to say, he smoked me. 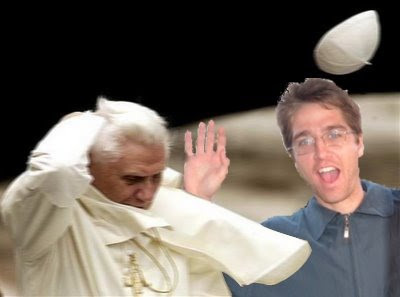 This last one is very simple, here is my other roommate playing "Catch the Zuchetto". The pope throws his zuchetto, and whoever catches it scores points. The one with the least points after 10 rounds wins. It is one of those "the last shall be first" kind of games. There was a catch, if no one caught the zuchetto, then everyone was awarded points. Oh the humanity. 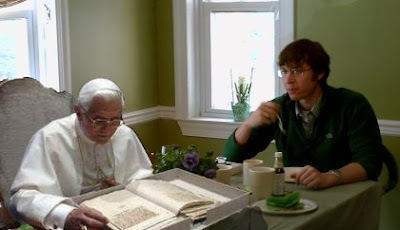 Over all it was nice to celebrate the Pope's birthday with him. He was gracious and kind. I taught him how to use Louisiana Hot Sauce, and he requested a case of Tony's seasoning and some Abita Beer be sent to the Vatican. Sounds like the party was a lot of fun! Great pics, too. How did B16 do blowing out 81 candles? The picture of you totally looks legit! I love it.